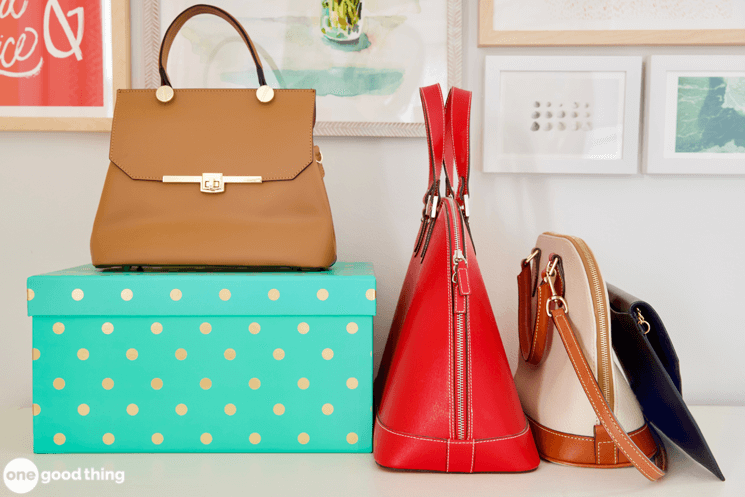 From small, inexpensive clutches to big, roomy totes, OGT readers open up about their favorite purses! It might seem silly, but one of my biggest pet peeves is having to carry a purse. But since I have to have the things I need with me during the day, carrying a purse is unavoidable. So I try to make carrying a purse as painless as possible by finding cute bags with practical features. While I do have a few bags at home that I use regularly, I wouldn’t say that I’m crazy about any of them. A few months ago I took to my Facebook page to ask my followers about their favorite pair of comfortable shoes, and I wrote a whole blog post featuring their answers. (You can read that post at the link below!) I decided that it might be helpful to get similar feedback about purses, to help me in my search for a great bag that I don’t hate carrying around. So I asked my Facebook followers to tell me about their favorite bags and purses, and today I’m sharing their incredibly useful insights! This small bag is perfect for times when you only need your phone, a couple of credit cards, and a lipgloss. It keeps things simple, while still keeping your hands free! This simple clutch would be great to carry on a night out. It has a cute chain strap you can use to turn it into a crossbody bag too! Why have just one purse when you can have three? ;-) This set includes a large tote, a medium-size crossbody bag, and a smaller clutch. Use one at a time, or mix-and-match depending on what you need! Some people prefer a backpack-style bag like this cute, faux leather option. It’s not as large or capacious as a school backpack, so it’s much more convenient to carry around. It will keep your hands free without getting in the way. This bag is really versatile because you can use is it as a handbag, a shoulder bag, or a crossbody bag. It has a structured design and is made of soft faux leather. This is a cute option for those who like roomy, slouchy hobo bags. You can pack all your stuff into it with room to spare! And thanks to the removable strap, you can use it as a shoulder bag or a crossbody bag. I’ve definitely become more of a fan of totes in the past few years. (As long as they’re not TOO big, because that just leads to me carrying around more stuff than I actually need.) This one is inexpensive, comes in small, medium, and large sizes, and you can pick from a wide variety of colors! This doesn’t necessarily qualify as a purse, but I felt it was worth including! Purse organizers are really helpful, especially if you like to switch between bags often. This one comes in two different sizes and six different colors, and they have plenty of pockets to keep your stuff organized. Travelon makes all styles and colors of bags. They have straps/handles with metal mesh inside so virtually impossible for anyone to “cut and run”. Zippers have lobster claw for fastening. Great for travel, especially in areas where pick-pockets prevail. I purchased my first Dooney & Bourke several months ago & have to say that it is the best constructed bag that I have ever owned. My only problem with it is the weight. That bugger is heavy! Does anyone else have a problem with that or is it just the style of bag I chose? After the umpteenth time grabbing my purse and running out the door just to later find I had left my wallet, phone, etc., I now have a see-thru purse (aka stadium bag). Maybe not the most stylish, but it is all about convenience and practicality for me. I just hold it up for a quick inventory, then I’m out the door. There are tons of styles from messenger to tote to muti-pocket. Best thing ever! Another great bag is the Duluth Trading Oil Cloth Sling Bag. Regularly $54.50 but can be found on sale for less. This has a wallet section built in and large covered section for larger items, which is accessible with the top zipper in the flap. Also an open pocket area on the back which I put an ipad into. If not the ipad, keys, iphone etc. I have it in several colors. Mine are a couple of years old but don’t look it! The best bag I’ve EVER owned…. I won’t even give it up for summer styling (it’s black). It’s made by Coach and it’s also the most expensive purse I’ve ever purchased, but worth every penny! I like Baggalini and Multi-sac for great function. These are great for traveling. I’m not into printed handbags that much, but one of the very best bags I have ever bought was a Vera Bradley black quilted nylon bag. I have used it a lot and it still looks great. Just a little FYI-I clicked right through on #1-the Piazza Daybag-it just so happens to have a 20% off coupon RIGHT NOW through Amazon. Click to redeem as you add it to your card! Thumbs up! I am getting it in black. Perfect bag for my lifestyle! Thanks for this-I found quite a few I’d like to try. I love my MultiSac backpack purse. It has seven zippered compartments on the outside alone. Inside, there are two 3” x 4” drop in pockets on one side and a 5” deep by 6” wide zippered pocket on the other side. I never wear it as a backpack, though. I prefer to wear it over one shoulder or as a crossbody when I’m shopping where I’m bending over and picking up things to keep it from swinging around and getting in my way. Maybe I SHOULD wear it as a backpack after all. I challenge you to go without a purse. I have witnessed so many women leave their purse on a chair or table in a crowded room and walk away. Not safe in my mind. I make sure that my clothes have pockets. I mostly just carry my wallet, phone and keys. Think about what items you have in your purse; I bet many are just in case items that could be left in the car or a desk drawer at work. Sorry, but I have my phone… which keeps getting LARGER, my money and credit cards, photo ID, sunglasses, tissues and mints for myself, husband and grandkids, lipstick as well as mace and keys…. nope, my purse is a MUST-HAVE everywhere I go because I wouldn’t be able to keep my cargo pants up if they held all my ‘necessities’!